The first few scenes lasting about 15 minutes have absolutely no dialogue at all. This is such a bad move in my opinion. It is around this point that I’d imagine most people without nerves as strong as mine would switch off because absolutely nothing is happening. I sit on my sofa wondering why are we watching people graduating and getting their pictures taken? *yawn* It is an extremely strange way to start a movie I must say. It is just so frustrating watching this movie. Scenes are being put together that just don’t fit. In one scene Mama G is being consoled by a classmate (this is after they already show her graduating) who tells her to take heart because “university is different from secondary school.” Do secondary school students have graduation ceremonies and how would a middle aged woman have been in secondary school? Mama G is also “mama” in a house of girls and it looks like she is a cult leader. Uche Ogbodo is here doing her usual masquerade. Oooooh I tire I tire I tire! Why won’t one of these producers tell her that she can’t just be running around set like a clown? 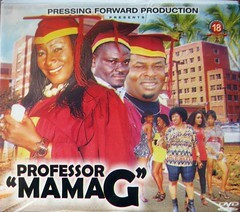 Its like actors and actresses just do what they like in Nollywood. How else can Uche’s consistent masquerade make up no matter the role be explained? I WOULD NEVER IN A MILLION YEARS RECOMMEND THIS MOVIE. BUYER BEWARE. This movie is a hot mess waste of time. It is supposed to be a comedy and it is not even funny in the slightest. It is only because of Mama G that I endured it for as long as I did. 30 minutes in and I’m too disappointed. I just can’t bear to continue although I do fast-forward a little bit first just to see if there is any hope and trust me when I say. THERE ISNT!!! The story doesn’t make sense. I can’t even be bothered to waste any more time on it and I’m onto the next. @Belle What a horrible horrible movie. And they even had the nerve to do part 3. Sorry eh. LOL I do feel better that i'm not alone in watching this though! @Osmond'DubemIkwueme I must say Osmond. you have spoken really well. Kudos.